CHRIS has started playing DNA Bass Amplifiers. DNA 800 bass head, DNS 2x10, DNS 4x10. "DNA bass amps take the old David Eden's to a new level. It's as good as it gets." CHRIS is featured on the DNA ARTIST WEBPAGE. Chris was a long time DAVID EDEN E-3 Endorser. 1996-2015. Chris generally used to use a few EDEN 550 4 pound heads with an assortment of cabnets. 2x10's, 2x10 monitor cabs, 1x15's, etc. Chris has even rigged many vintage 1960's & 1970's cabs with modern Eden speakers. Yes, the same cabnets that everyone approaches about Chris live, wondering how a SUN or FENDER cab can sound so good.?... These are EDEN hot rodded..
2016: Note. EDEN was taken over by Marshall. Artist communications took a HUGE hit. People were laid off here in the USA and operations were moved to London. The end of a long happy relationship! Bummer! KEITH ROSCOE BASSES: Chris has played Keith Roscoe Basses since 1997. Chris is often seen with LG-5 String Fretted with a one piece ash body and bolivian rosewood. He also plays a LG-5 String fretless with a quilted maple top, mahogany back, and diamond wood fretboard. Chris occasionally plays a 4 string Roscoe Century for straight ahead jazz gigs. Washburn Basses & David Eden Amps are owned by our friends at US MUSIC. Chris owns and occasionally plays Washburn instruments. His favorite is the AB 90 Bass. The AB 90 is a four string hollow body that makes a wonderful blues bass. Chris also occasionally plays Washburn's AB 45 Acoustic electric bass and a Washburn Force 5. Chris plays a BILL CONKLIN Mobile Electric upright bass that was built for him in 2002. It is more of a MEU proto type than the standard MEU that you see today. It has been heavily modified with a new bridge and a Realist Pickup. Chris blends the Realist with the original Pizzo pickups. http://www.myspace.com/video/jonraven/dave-isaacs-isabella/22724927#! Video of Chris playing The Conklin MEU with Dave Issacs. 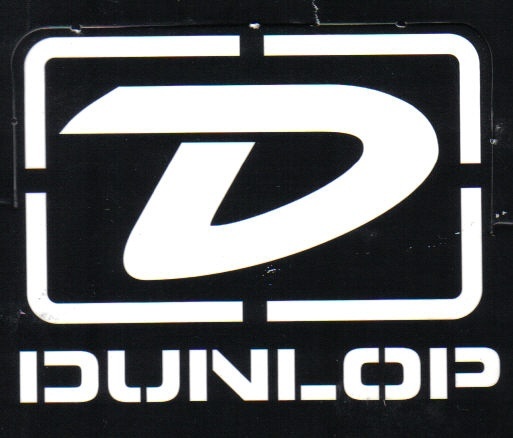 Chris has endorses DUNLOP STRINGS since 2010. He has used Dunlop's bass Wah since 1998 wearing out two of them!! PIGTRONIX EFFECTS: Chris has been endorsed by PIGTRONIX since 2008. He uses their ENVELOPE PHASER as well as their TREMVELOPE. 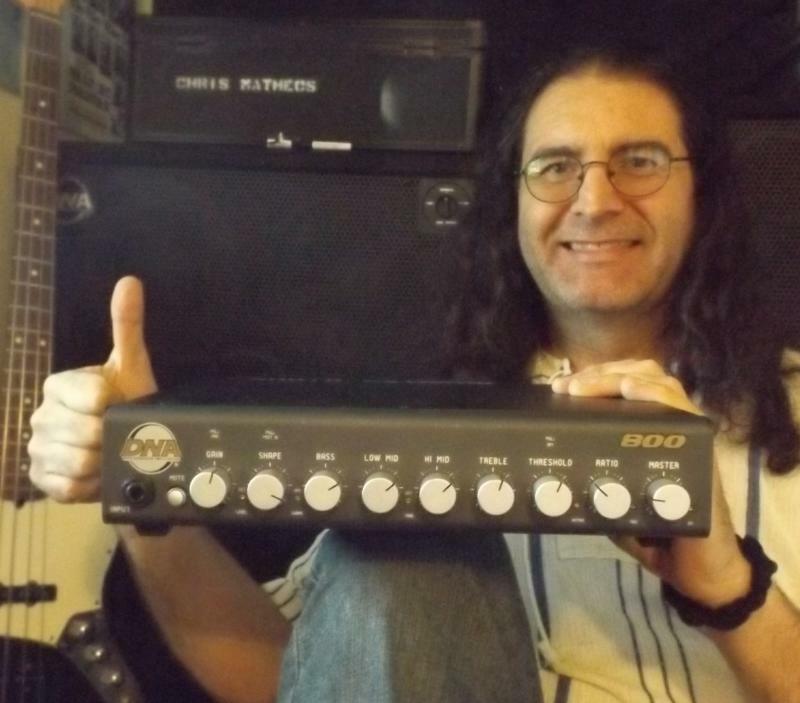 CHRIS: "PIGTRONIX is the best effects company I have ever encountered. They are the most versatile and durable"... PIGTRONIX EFFECTS are heavily used on all Chris' solo cd's from 2010 onward. Chris uses the TREMVELOPE with his Piccolo Bass regularly. ASLIN DANE BASSES: Chris endorsed ASLIN DANE for a short time from 2002-2004. He played their signature 5 string and their Music Man Models. Chris liked the sound of both instruments but experienced serious unfixable issues. Chris says that: "The Aslin Dane Basses made a great student bass. Unfortunatly I did not find them to be road worthy for full a full time musician. I imagine that they have addressed the problems that they had in the early 2000s." Chris was endorsed by Songbird in the late 1990's. He played their 4 string Fretless acoustic electric. It is featured on Chris' Famous Jazz Bass Chord Progressions Book/CD. Chris also played this bass live regularly with The Pictures In Sound fusion trio in the same time period. CHRIS: "Songbird made one of the best sounding Acoustic/Electric Basses on the market". Chris also played their jazz bass. Not even sure if SONGBIRD is still in business?/? 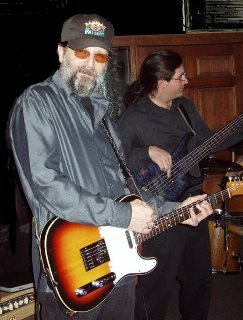 Chris with Michael Falzarano playing his Roscoe 5 String Fretless bass. 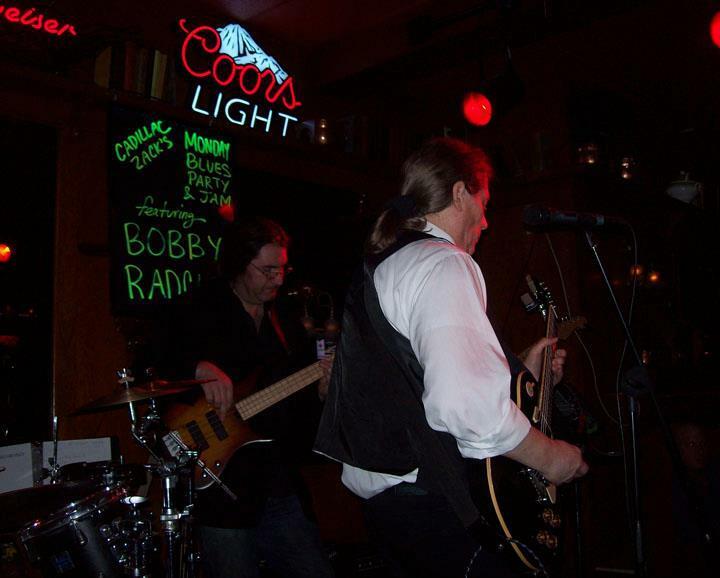 Chris with Bobby Radcliff playing his Roscoe Century 4 String Bass. ABOVE: Chris with his Washburn AB90 bass. ABOVE: Washburn Force 5 Bass featured on the cover of Chris Slap Bass For 5 & 6 String Bass. Chris plays his CONKLIN MEU with Armand Lencheck. Chris with Aslin Dane Music man. A.R.T. EFFECTS: Chris was endorsed by ART in the late 1990's. He regularly used their NIGHTBASS EFFECTS unit. ART discontinued their bass effects department. There are many fun clips of Chris on Youtube playing ART Effects. Chris endorsed Aria Pro Basses from 1996-1997. He played their 6 string bass and one of their 4 strings. Chris has always been a big fan of Aria's famous John Taylor bass (used by John in the 1980's Duran Duran heyday).